If you have come across the NPC Bonin Magnus Minstrel Moonlit Night Legend quest asking for the normal precision stone but not sure where to get, this guide will help you get the ‘mysterious‘ stone. Many new players will get stuck or lost at doing this bard quest in Payon because they don’t where to find it. The same thing happened to me too when first doing the quest. 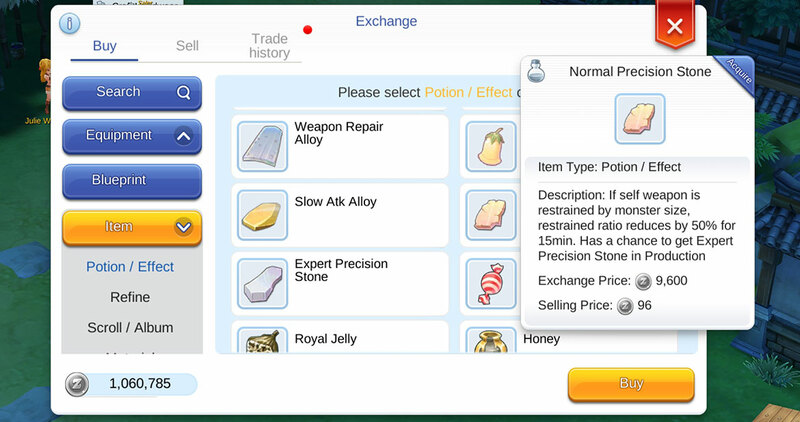 You can’t get it from NPC shops, the quickest way to obtain through Blacksmith production or buy the normal precision stone through Exchange. You can find the stone under Items > Potions / Effect and cost about 9,600 zeny. After successfully handed the stone to Bonin, you will unlock the quest where you need to kill 300 Eggyras in Payon Cave.